Free Counter A Walking Tour of Gävle. 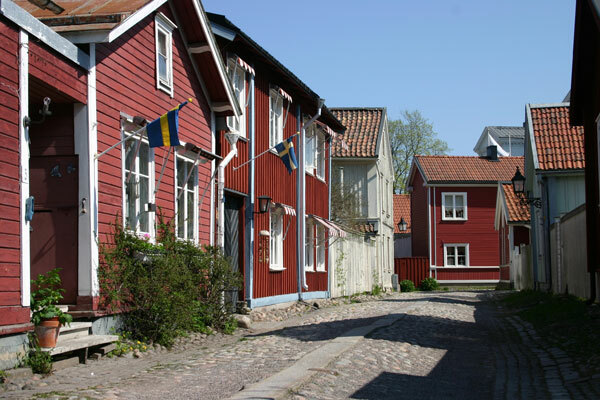 Founded in 1446, Gävle is northern Sweden’s first city. There has been a church on this spot since the 1400s, when Gävle was first settled, and it is likely that the town was actually founded here. During Sweden’s reign as a world power in the middle of the 1600s, the church was renovated to its present look. The tower, however, was not completed until 1781. The church is one of the few buildings north of the Gävle River that was spared from a massive fire in 1869 that burned down much of the town. Pay attention to: The church tower, which leans a half meter. It started leaning from the moment it was erected due to the poor sand and clay foundation. Gradually, efforts to keep the tower from moving further were successful. This work was funded by an additional town tax on coffee and sugar. Created in 1948 and moved to the City Park in 1983, this statue was created by one of the most famous Swedish sculptors, Carl Milles. The word genius is Latin and means, “good spirits”. 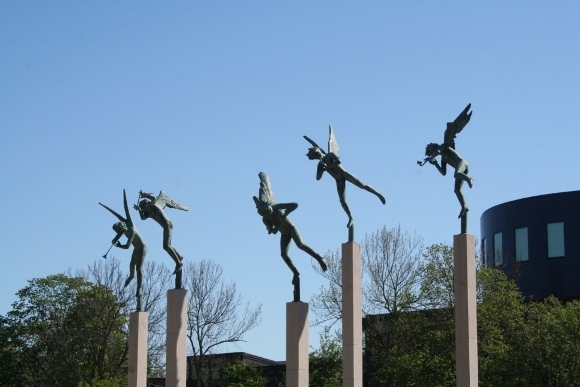 Flying angels were one of Milles’ motifs and this can clearly be seen in the statue. 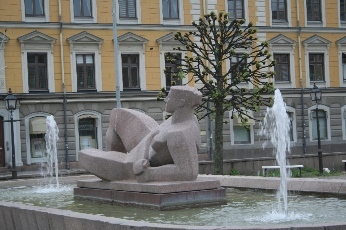 The sculpture has many replicas located throughout Sweden, including one in Milles Park in Stockholm. This tree-lined avenue was first created in 1842 and received its name in 1987. Agnes von Krusenstjerna (1894-1940) was an outspoken Swedish author who lived in Gävle for a short time. The city’s environment and surroundings can been seen throughout many of her works. 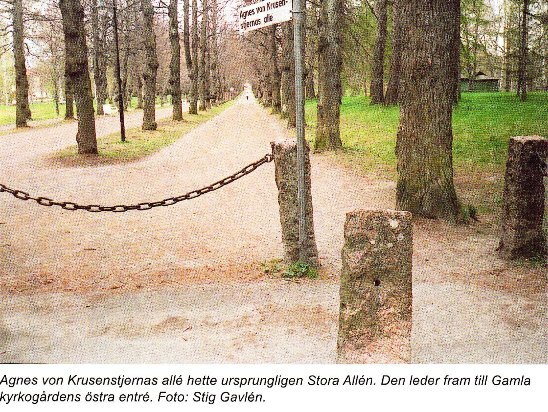 The City Park is actually made up of two separate areas. It began with the city’s gardens, which started being built in the 1840s. In 1865, the Boulogners Forest was added as an extension to the gardens. The inspiration for the park was the Bois de Boulogne in Paris. Streams and walkways connect the two areas making it feel as one. Here, you will find a café, paddleboats, miniature golf, and a popular playground with barbeques for grilling. There are also many statures and sculptures located throughout the park. At the art center you can enjoy many different forms of contemporary art, from paintings, photographs, sculptures, and video. The open studio located inside allows both children and adults to try their hand at creating art. The building, originally completed in 1961, houses Gävle College’s program for design and woodwork, as well as Cafe Spegeln and was originally designed for the forest museum Silvanum. By 1903, Gävle had already built a modern sports arena located next to the Gävle River. Over time, the arena was gradually enlarges and modernized. The present day sports arena was inaugurated in 1923 and received the name Strömvallen. Pay attention to: The bronze statue of the runner that stands outside the entrance. 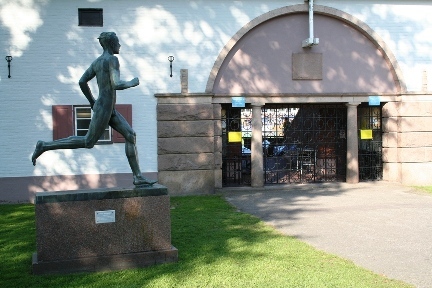 It depicts former Gävle resident and athlete Gunder Hägg who captured 16 world records between 1941 and 1945. 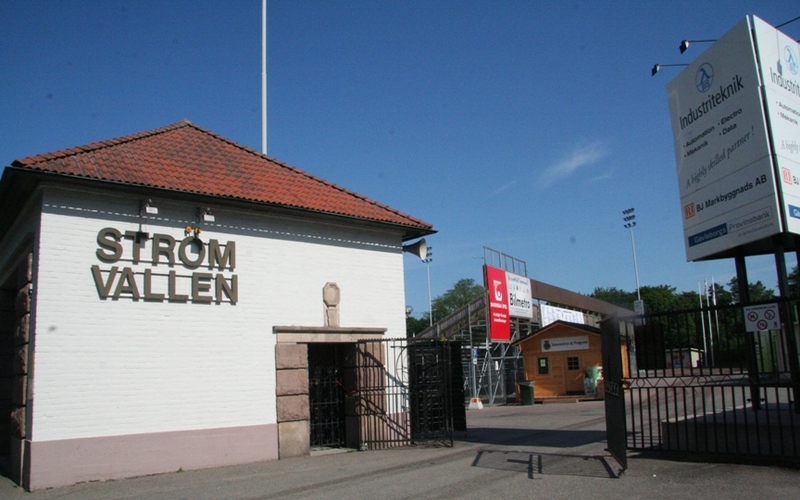 Today, Strömvallen is a football arena home to Gefle IF who plays in the Swedish Premier Division. The arena’s capacity is 7300 and the field is composed of artificial grass. 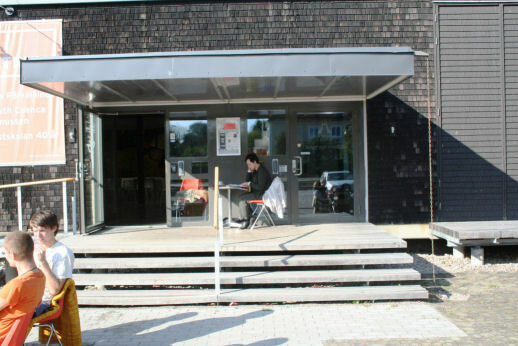 The concert house was inaugurated in January 1998 and is located on the same spot as the old bathhouse, Strömbadet. Bo Karlberg was the architect who, among others, designed the opera house in Gothenburg. 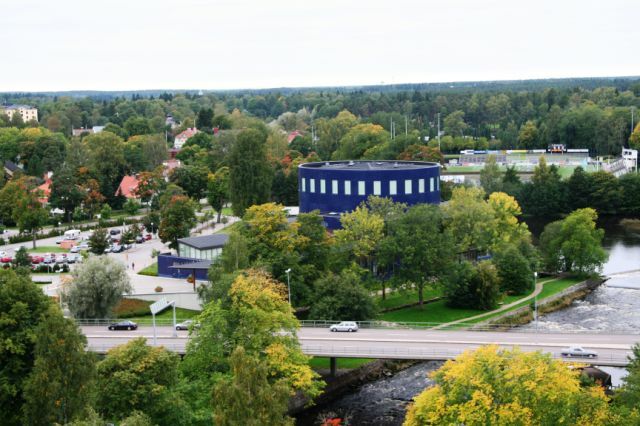 The circular building is dressed with 138,000 blue tiles and is home to the Gävle Symphony Orchestra. Inside the concert house you will find two music halls, the Gevalia Hall with 820 seats and Bo Lides Hall with 170 seats. The Gävle concert house also contains a music library, a cafe, and a restaurant. 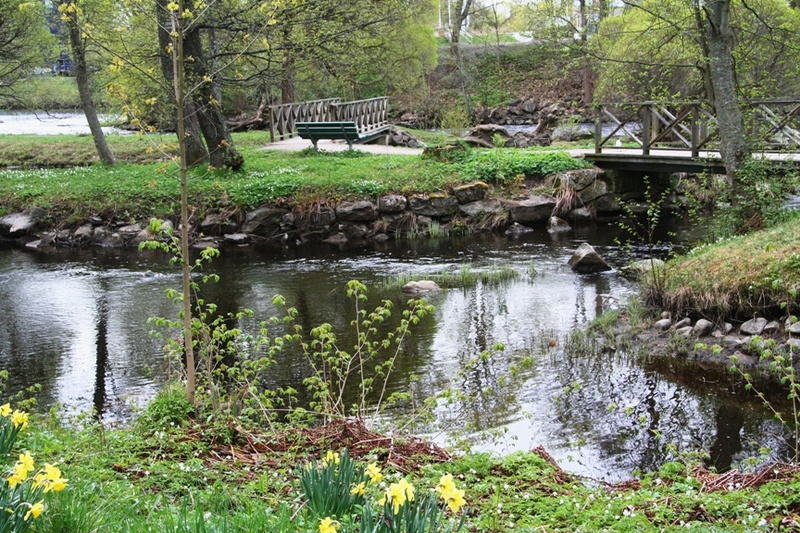 This is the oldest bridge in Gävle and until the 1580s it was the only way over the Gävle River. During the great fire of 1869 the bridge was damaged and torn down to keep the fire from spreading to the south. The bridge you see today was rebuilt between 1869 and 1870. In an authentic environment you will experience part of Sweden’s crime and punishment history. In the castle dungeon, prisoners were locked together in a dark, cold room. Many awaited harsh and repulsive punishments. When the prison cell system went into effect in the 1840s, public humiliations and physical punishments were replaced with judgments of prison time or manual labor. Prisoners would receive their own cells, but were not allowed to speak to each other. Often, a large facemask was used to prevent prisoners from seeing each other when they went out into the yard to exercise. On the south side of the Gävle River lies the Gävle Castle. When King Johan III built the castle, in the year 1593, it resembled a castle from a fairytale, complete with pinnacles and a tower. Today only the bricklayer is original. Legend has it that in 1727 a castle maid was on her way to the attic to gather laundry that was hanging to dry. She was using a candle to light the way when she suddenly realized that the dry laundry had caught fire. The fire spread rapidly. The tower and a large portion of the castle burned to the ground. When the castle was restored again in the middle of the 1700s, a new tower was not built. It was not considered modern at the time. 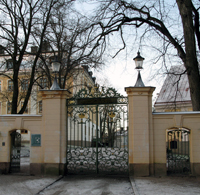 Carl Hårleman was the architect behind the new construction and it has since been used as governmental residences and offices. Some believe that the maid who started the fire still wanders throughout the castle, so look closely and maybe she will show herself. During the months of December and January, the world’s largest straw goat stands proudly on the castle square. The gigantic goat is Gävle’s biggest celebrity. Every year in December it is unveiled and stands 13 meters high, 7 meters wide, and weighs three tons. The first goat was raised in 1966 and in the year 1985 it was added to the Guinness Book of World Records. 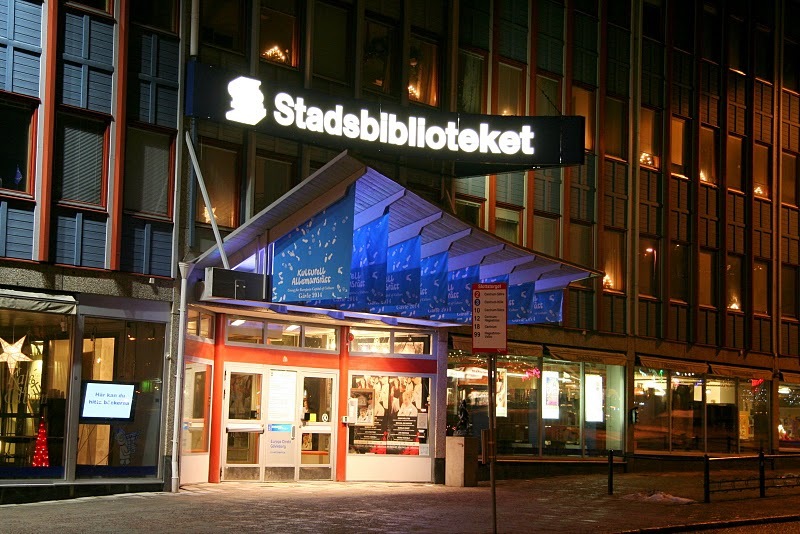 Gävle’s city library is open every day of the year and it is here where you can loan books, films, and magazines. There is a great fiction and non-fiction section for both children and adults. At the IT Square you can use the free computers and in the children’s area, kids can draw or play games. You can even buy a coffee in the cafe and read newspapers from around the world. Joel Hägglund was born in Gävle’s old-town in 1879. In 1902 he moved to the USA and changed his name to Joe Hill. He was known for singing songs, writing poems, and fighting for workers rights. In 1915 he was convicted of murder and executed, however, many believe he was innocent. Today, his old house in Gävle is a museum. On the second floor, inside the memory room, you will find a copy of his last letter home. 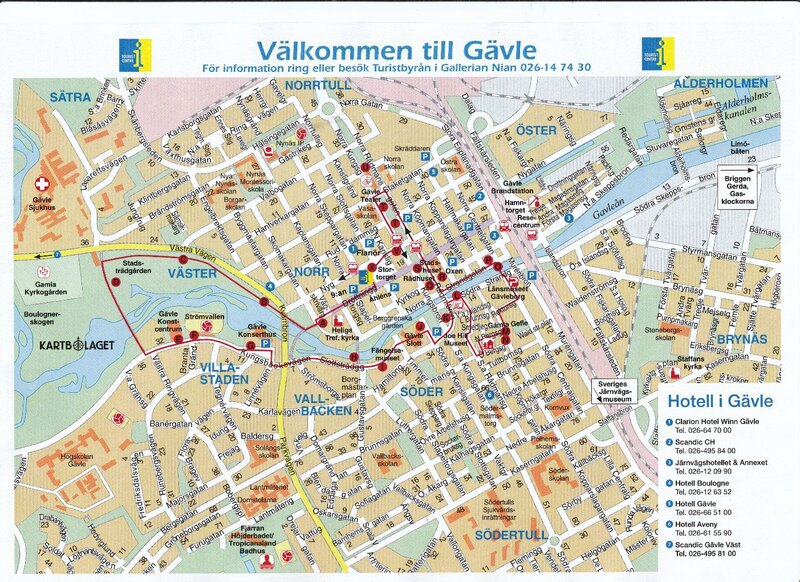 Take a stroll along the cobble-stoned streets of Gävle’s beautiful old-town, located south of the river. Most of the houses here are from the 1700s and have survived both fire and demolition. In the olden days, there were many fisherman and craftsmen who lived here. Pigs ran through the streets and the air smelled foul due to all of the outhouses in the area. Here, you will also find a hostel and the restaurant Söderhielmska Gården. The history of the County Museum began in 1933 when one of Gävle’s wealthy families donated a considerable amount of money to the town. The museum was built with funds from this donation. 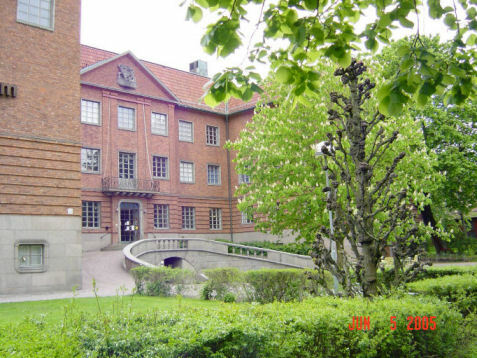 Construction was finished in 1940 and it was first called the Gävle Museum. To the request of the donors, the museum was built using Antonie Rettig’s sister’s palace in Copenhagen as a model. Here you will find a unique collection of Swedish art from the 1600s to the present day. You will also find historical exhibits, a café, and a boutique. The architect Ture Stenberg designed this beautiful hotel for a large town exhibition in 1901. When it was inaugurated, it was one of the largest hotels in the area. For 40 years it was used as a hotel and then rented out for a variety of different purposes including: a cinema, nightclub, bank, theater, chocolate store, and cultural school. When the town’s old Town Hall burned in 1776, C. F. Adelcrantz designed a new one with new classical traits. It was completed in 1790. As a gift, King Gustav III gave a marble medallion with his portrait and 4,500 riksdaler to the builders of the Town Hall, which was now composed of three floors with a clock tower. The upper part of the building, the onion-like tower, and most of the interior was destroyed in the fire of 1869. The building was restored in 1870s with a different facade, a steeper roof and a tower in a tighter form. Businessman Pehr Ennes erected this building on the Town Hall Square between 1803-1805 as a residence for his family. The city of Gävle bought the house in 1848 upon his death. The building was mostly destroyed in the fire of 1869, but was built up again between 1871-1874. 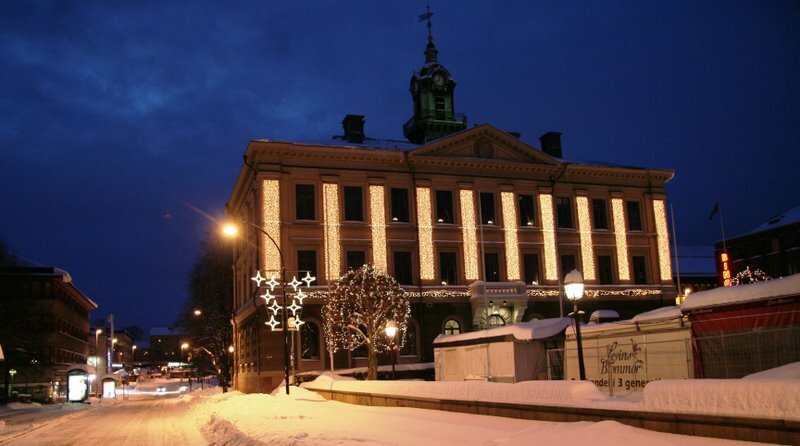 Today, the City Hall is used by the Municipality of Gävle, but still contains a magnificent festival hall and other beautiful rooms. In May 1956, Eric Grates giant granite sculpture ” Gudinna vid hyperboreiskt hav/ Goddess by a Hyperborean Sea” was unveiled. It is located in front of the Town Hall Square. When the sculpture was first presented it was met by protest from many people. 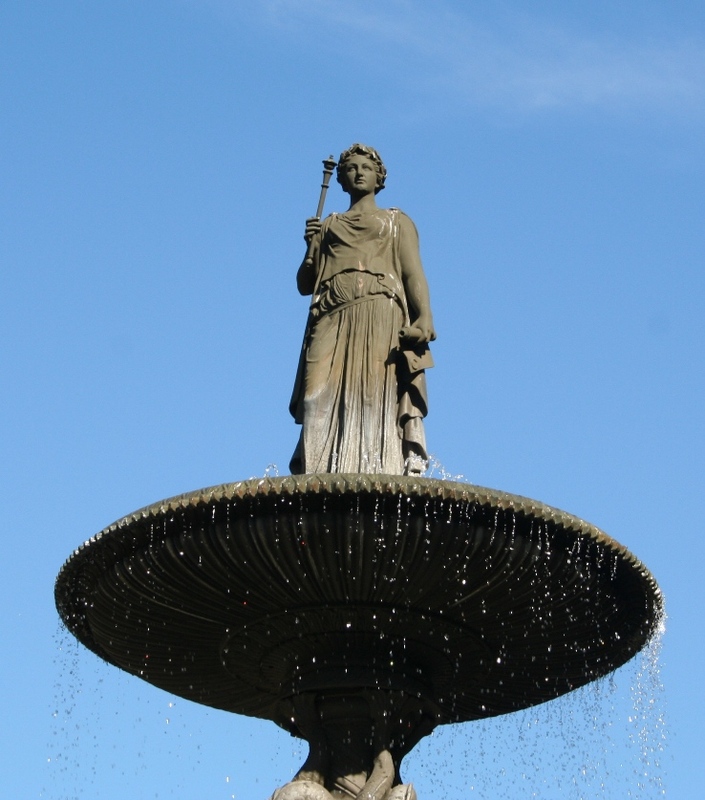 These two large fountains were created in 1880 by Carl Johan Dyferman and were given to the city by Anders Magnus Hedberg, a businessman who’s residence was located near the park area between main street. On the top queen Kristina married with king Karl IX, mother to Gustav II Adolf and Grandmother to the real queen Kristina. During the fire of 1869 the Gävle theatre was completely destroyed, but in 1878 is was restored with a new design. The Paris Opera house inspired the architecture and it also resembles the Kings Opera house in Stockholm, which would not be built until 20 years later. The facade is adorned with the names of Shakespeare, Moliére, and Mozart. In olden days there were two cafés located within the theater. One for the poor and an extremely ornate cafe with golden walls that only the rich could enjoy. In 1983, a large addition was built on the theatre’s north side where “ Gävle Folk Theater” is inscribed. 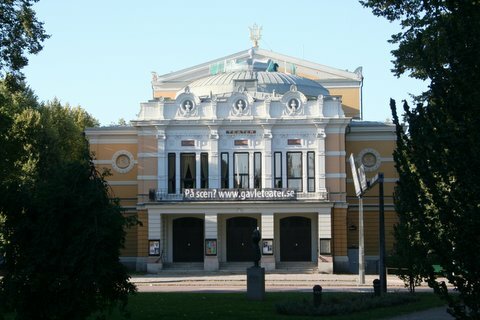 Today, the Gävle Theatre is used mostly as a venue for guest appearances. Pay attention to: The names of Shakespeare and Moliére. Both are spelled wrong and have been that way for over 125 years. 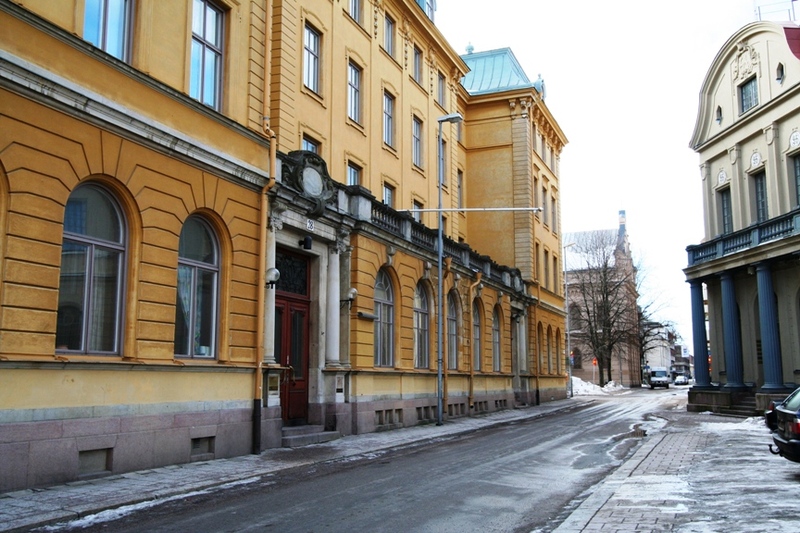 This stately building was constructed out of marble and red granite by Gävle’s Savings Bank in 1899. The architect, Aron Johansson, also designed the Parliament building in Stockholm. In the beginning of the 1900s, farmers sold meat directly from their horse drawn wagons on the town square. Today, the town square is a square filled with life from, performers, events, markets, and more. Here, you can buy everything from sausages, flowers, fruit, vegetables, and clothing. You can even buy fresh fish directly from fisherman. Don’t forget to: Take home a ”kast” of smoked herring to remind you of Gävle. The word “kast” is an old Swedish term used for ordering four smoked herring. (Just now they are building a new Town Square. It will be finished this summer).